How Green is Your Company? Vault Digs for some Answers! Energy conservation came at No. 2. No. 3, however, was a zinger, with a little over 77% of the companies admitting that their biggest "green" initiative was simply emphasizing eco-friendly business practices on their company websites. Anyone thinking reputation-building exercises? 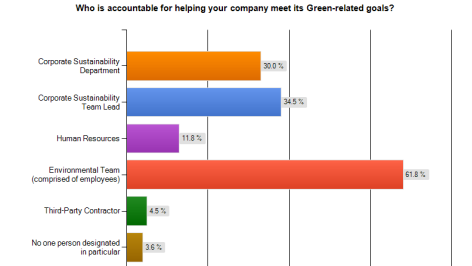 We asked companies to tell us who is held accountable for helping them meet their green goals. 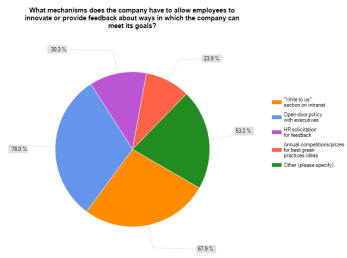 Over half (62%) said it was up to their Environmental teams comprised mostly of employees with a handful of companies giving the responsibility to senior leadership. Bristol Myers has appointed a VP of Corporate Environment, Health, Safety & Sustainability to reach their ecological goals; ABB has a global head of sustainability; consulting firm Accenture has an Environment Steering Group, investment bank BMO Financial has a dedicated team of five full-time employees who focus solely on their products and services and how they affect the environment; and Philadelphia-based law firm Cozen O'Connor has a dedicated firm sustainability officer. This question evinced few responses to rejoice over. The winner was certifications with less than half of the surveyed companies focusing on LEED certifications for their office buildings and ISO 14001--a known standard for environmental management. Followed closely at No. 2 and No. 3 were actively distributing information on green products through their public websites (43%) and donating to environmental causes (42%). 78% of the surveyed companies, which ranged from banks, consumer products manufacturers, consulting firms and law firms to utilities and pharmaceuticals, said they have an open-door policy in place to encourage employee innovation and green initiatives. Almost two thirds also said they encourage staff to send in suggestions via their website's/intranet's "Write to us" section. While almost 70% of respondents said they tried to move closer to a sustainable business model by preferring to do business with environmentally-friendly vendors and third party suppliers, over half said they preferred to do so by participating in their industry-specific conferences and seminars. For example, Delta Airlines participates in the Commercial Aviation Alternative Fuels Initiative and the Roundtable for Sustainable Biofuels. The clear winner, sadly, was recycling paper and electronics. Sadly, because these measures are considered elementary at most companies in today's new ecological consciousness age. What do you think? Does you employer go the extra mile to be more friendly to the environment? Drop us a note at In Good Company or follow us on Twitter at @VaultCSR and become a part of the discussion. Answering Reader Comments: Quantifying CSR to Spur Action A "Slippery Slope"